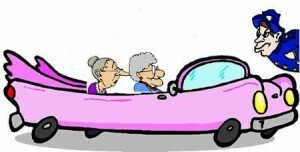 It was a small town and the patrol man was making his evening rounds..
As he was checking a used car lot, he came upon two little old ladies sitting in a used car. He stopped and asked them why they were sitting there in the car or were they trying to steal it? That old rascal Ramana, sent these two dolls along this week. This entry was posted in humour on May 2, 2013 by Grannymar.